It must be tough pushing the Riesling wagon in Mudgee. I mean, we’re talking about a region that already has challenges with its identity, let alone focusing on a variety that is (unfairly) a hard sell. Tricky. Tricky or not, these Robert Stein wines are high quality. Region-defining quality, if you like, and enough to hint that ‘The Mudge’ could make half-decent Rizza more often if given a chance. 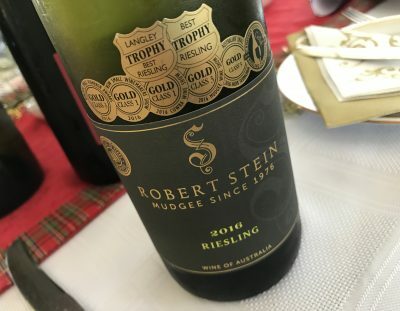 That said, young (he’s only a few years young than me, but let’s call him young) Robert Stein winemaker Jacob Stein has devoted years to the Mudgee Riesling cause, and it’s apparent in the wines. The ‘standard’ Riesling, in particular, has the intensity and length that you’d expect to see in a top-flight Watervale example, except in a Mudgee form, and the slow-build Reserve will live for eons. Picked from a selection of vineyards in Mudgee. This is festooned with gold medals and trophies too. A winner. It’s overflowing with overt lemon and grapefruit juice aromatics in a super intense, essence-of-Riesling form. Long, tangy, acid driven palate is super powerful, and the acidity doesn’t come from unripe fruit – so none of that Riesling heartburn. Sharply focused, classic Australian dry Riesling. Best drinking: 2017-2035. 18.5/20, 94/100. 12%, $30. Would I buy it? Sure would. Handpicked from a single vineyard from Mudgee, this was whole bunch pressed and wild Fermented in old oak and tank. There’s an intensity here which is notable – and particularly for Mudgee. Lime and apple, it’s a slightly sweet and sour wine, but the tart acid drives this wine forward at speed. Gee, it’s deep and long. Interestingly I prefer the less overtly acidic and more classically aromatic standard Rizza at this point, but the length here assures this will be a better wine in time. Impressive intensity too. Best drinking: 2017-2040. 18/20, 93/100+. 11.5%, $40. Would I buy it? I’d love to have a bottle to see in 5 years time. Handpicked and whole bunch pressed with pressings fermented in old oak. Medium-dry according to the back label, but the balance is solid, with just a little edge of lime cordial. I’d argue this is still better as a drier wine, but the sweetened lime juice is tasty when it’s ice cold, and this is smarter than many an off-dry Aussie Riesling. I’d open this sooner rather than later (on my tastes – if the sweetness integrates more, this has the length). Best drinking: 2017-2019?. 17.5/20, 91/100. 11.5%, $40. Would I buy it? I’d prefer the other two wines personally.